Happy Wednesday to you! 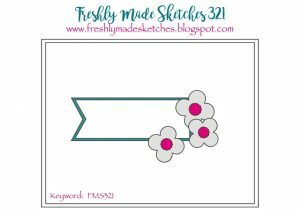 I get to share the latest Freshly Made Sketches challenge with you and I’m in love with this one. 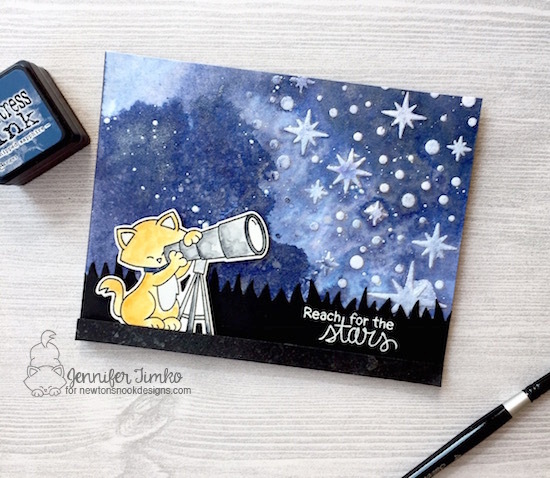 The amazing Jen Brum is our sketch hostess and she has a really fresh and creative challenge for us this week. And shockingly, I mostly just stuck to the simple directions, haha! Back in December I was lucky enough to be one of the winners of a prize from the Coffee Lovers Blog Hop. I won a gift card from Gina K. Designs!! I resisted using it right away (wow, was that hard!!) but held onto it to find just the right thing. And the right thing I found! 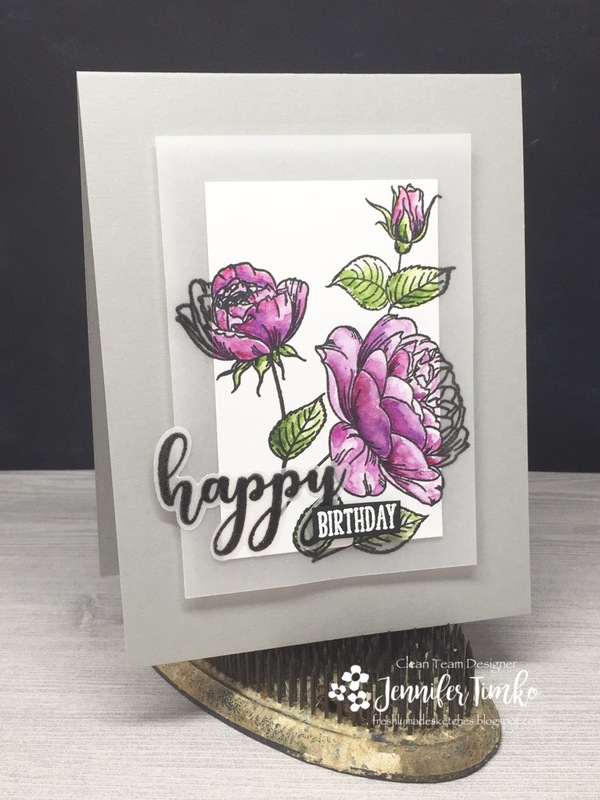 I just ordered the Hearts and Flowers StampTV Kit and it arrived last week. Needless to say, it called out to be used on this sketch! I stamped the flower insides first in Versafine Onyx Black ink and then positioned the flowers to layer on top. 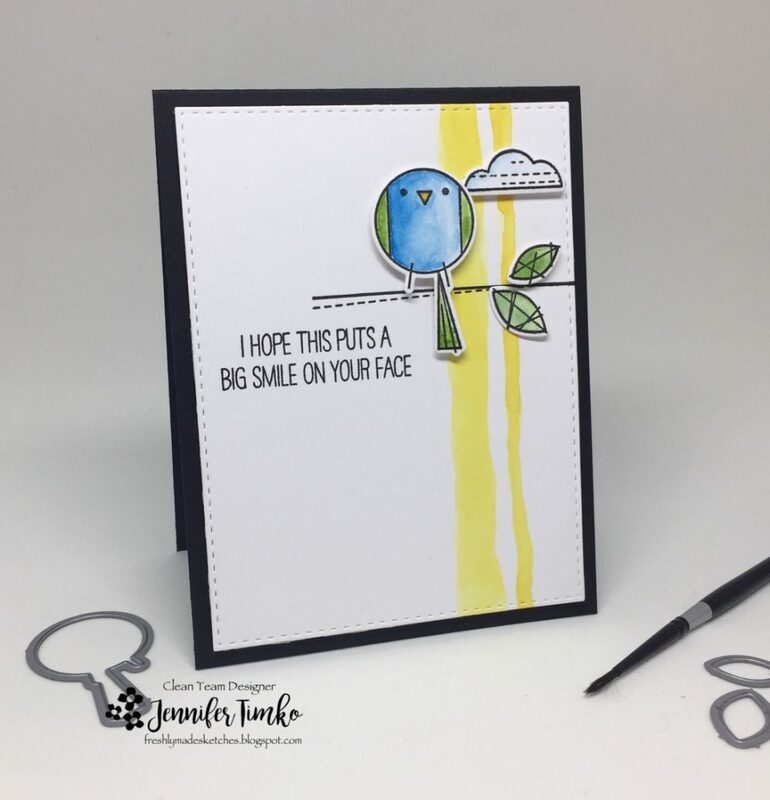 After inking with Gina K’s Dye Inks, I spritzed before I stamped to create an easy watercolor feel. I let the flowers dry and the hand painted the banner using the Blue Lagoon Ink by Gina K. After the banner was dry, I added a sentiment from the stamp sets. To add a little more texture, I splattered on some black ink and added some black rhinestones. 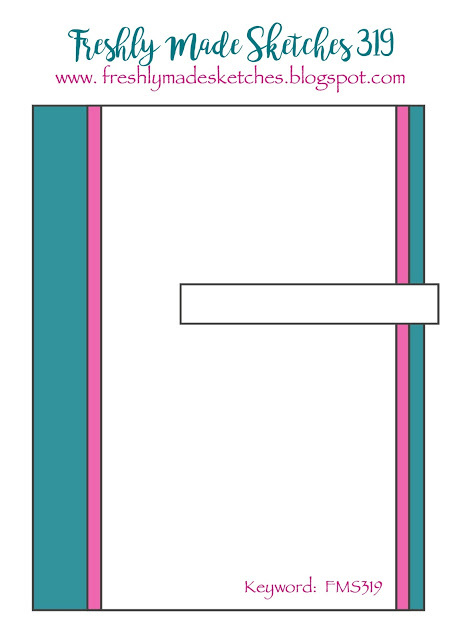 The watercolor panel is cut using a stitched rectangle. I cut yellow base to match the card size. 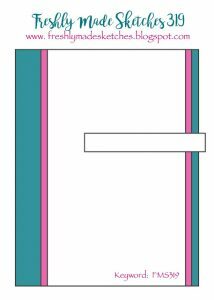 No border on the front but a pop of color when you open the card. 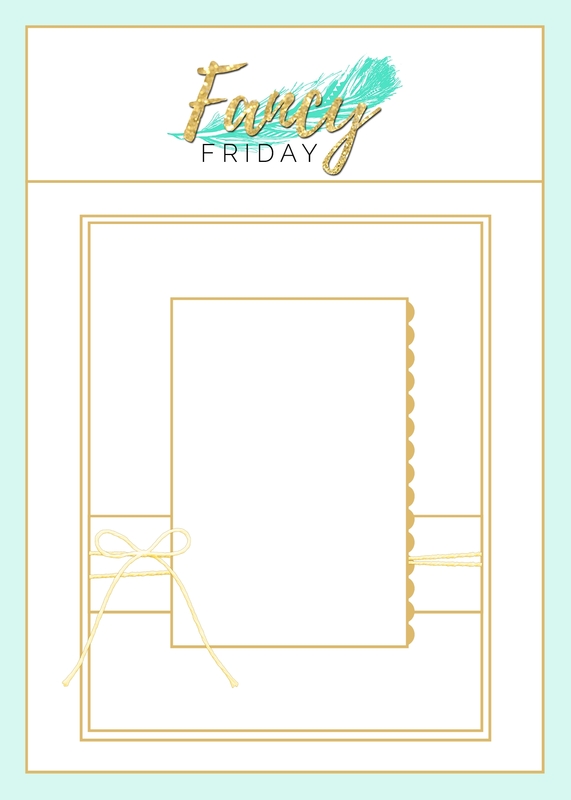 Somehow this is really appealing to me lately…a way to have the clean front but still have an extra surprise. Well, off to see all the marvelous creations from the team!! 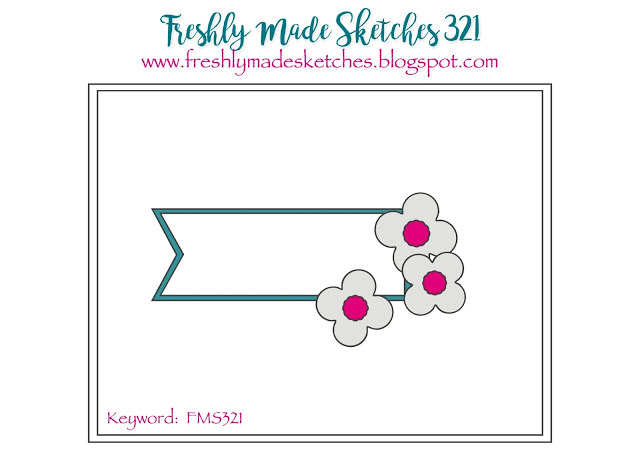 This is a sketch that can be perfect with whatever little shapes you want to use. Hope you have fun with it and looking forward to seeing you in the gallery!! Thanks for stopping in! Happy New Year!!! I hope you had a safe and joyful holiday season! So excited to be back today after the hiatus. 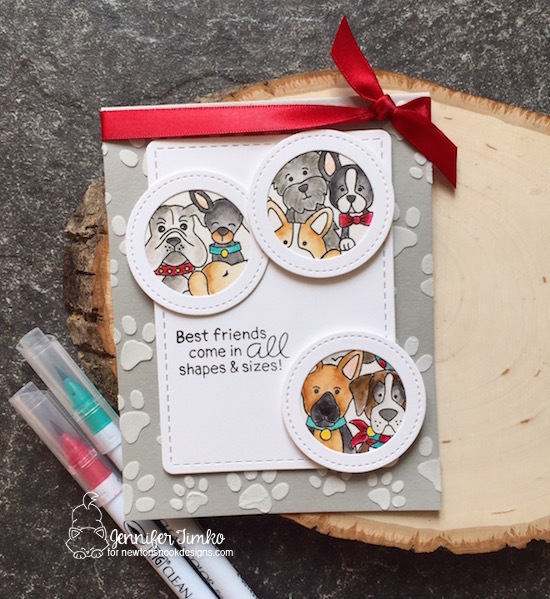 We have the perfect sketch at Freshly Made Sketches courtesy of the amazing Rita Wright and it will get you back to stamping in no time!! This big panel provides infinite opportunities! 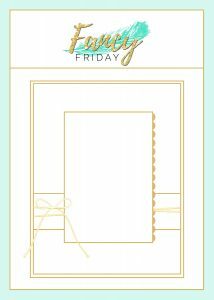 I had an unused stamp set from the fall that called out to be colored and I’m so happy I worked with it. 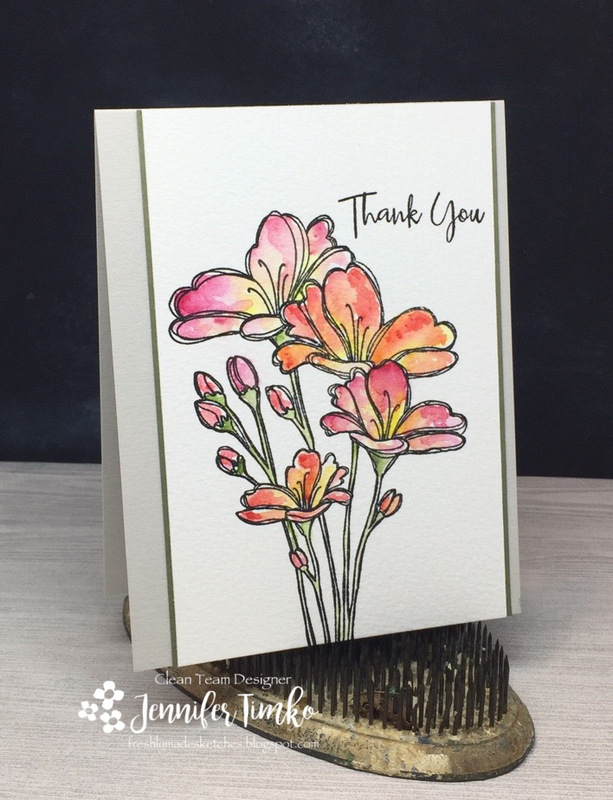 On Fabriano Extra White Watercolor Paper, I stamped with Versafine Ink with this flower from Bouquet of Thanks from Simon Says Stamp. Along with the stamp I had gotten the Debby’s Palette of Daniel Smith Watercolors so naturally I looked to Debby Hughes for inspiration on the coloring itself. I found this card and was inspired! I blended the colors of the palette with a loose coloring and had such fun playing with how they mixed. A good way to start getting back in the groove! The sentiment is from the same set and I used a panel of green behind the watercolor layer and then used a base of Fog cardstock. I hope you’ll be able to join us this week! We look forward to sharing in your crafty goals of the new year! Back tomorrow with some more coloring with a new to me product. Until then, thanks for stopping in! Hi everyone! Sorry it has been a bit since I posted. I needed a crafty break and had lots going on with my boys and work. But I’m getting back to the craft room this week and will have lots for you in the upcoming weeks. 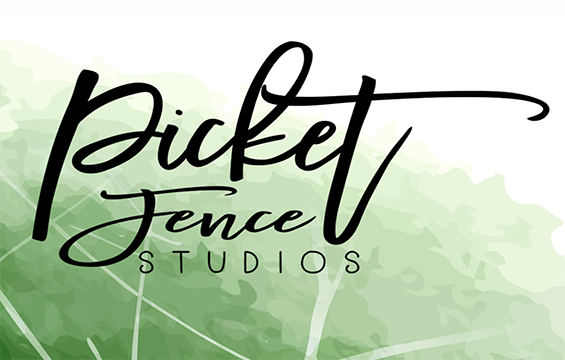 Today, I’m excited to join back in with the latest from Freshly Made Sketches. 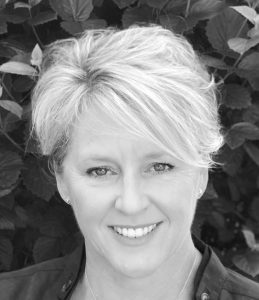 Our host this week is the extraordinary Karren Johnson, queen of coloring. And she has such a fun sketch this week. One that allows for elements to be combined and all kinds of creativity. After puttering around in my stamp room like I had no clue for a while, I finally settled on this set. Something about these birds always make me happy! Well, they are Happy Birds. 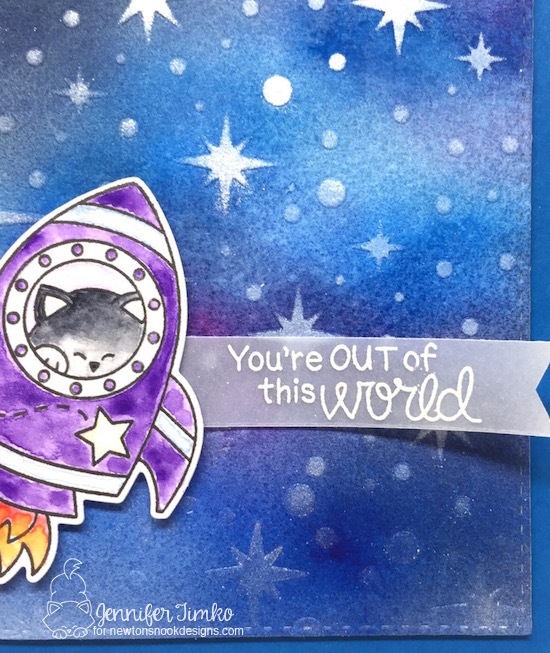 I stamped with Versafine Onyx Black on Bristol Smooth paper and then colored with my Winsor and Newton Watercolors. Instead of a “real” panel, I painted on some stripes for the vertical elements. Hopefully Karren forgives my loose interpretation of this part of the sketch. I love the stitched dies with the stitched details of the stamps so that was my final touch. I used the new Mini Dimensionals for attaching the bird and other little things. 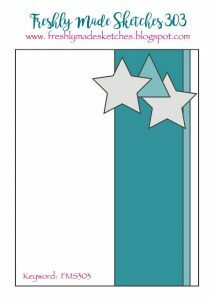 I have to say that this new size from Stampin’ Up is a must have for your glue arsenal (and I know we are all collectors of just the right adhesives). I think that like many in the US, I have been a little overwhelmed by what I am seeing in Texas. Watercoloring yesterday was good for my soul. Later today, I’ll be working on what I can do to help. There are many good references on what is needed and reliable organizations who will have boots on the ground to help. If you are not sure where to go, start here: United Airlines Hurricane Harvey Relief Fund. They have links to donate to vetted charities and you can even get a few frequent flyer miles for your donation. Back to the stamp room for me and I’ll see you soon. Thanks so much for stopping in today. I hope you have a happy Wednesday. 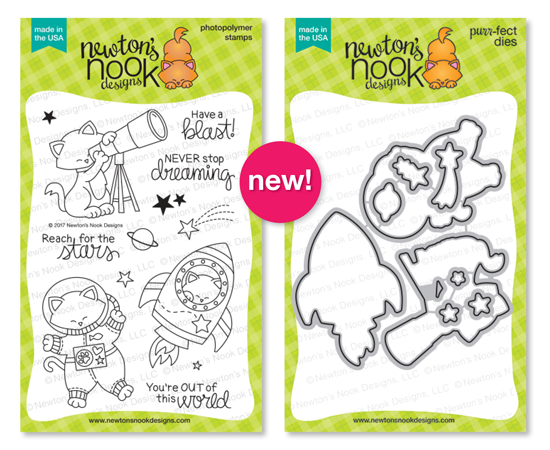 First of all, today is the day that the 4 Year Celebration release goes live over at Newton’s Nook Designs. 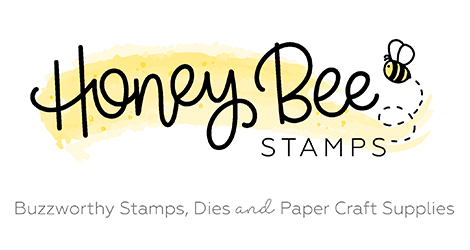 To continue the fun, we are having a blog hop and I’m so thrilled to be a part of it. I told you yesterday that my favorite set from this release was Cosmic Newton (but seriously, choosing a favorite is like choosing a favorite ice cream…I love them all!). 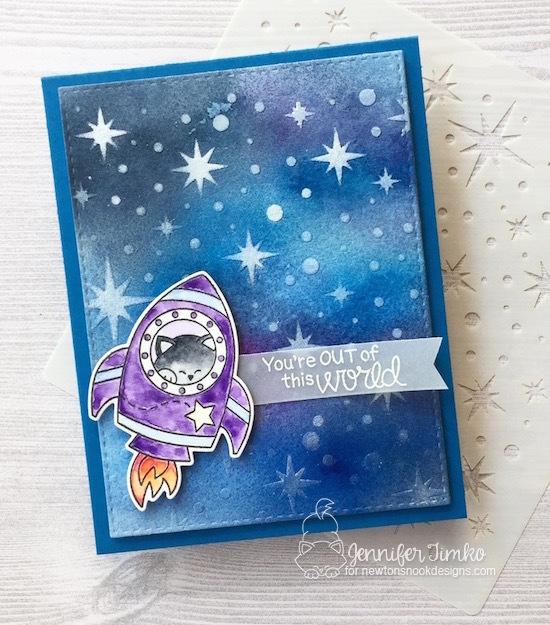 I used the new Stampin’ Up Embossing paste with the Starfield stencil on watercolor paper to start off my background. Next I added Chipped Sapphire Distress ink by painting it on with a brush. I got some of the light and dark coloring with that but wanted a little more dark. So I pulled out the trusty acetate and smooshed some more ink on, spritzed with water and applied to the panel. After it dried a bit, I spritzed on a Perfect Pearls mixture (in a spritzer with the powder and some water) to get a shine on the panel. And finally, I splattered on some Smooch Ink to add some extra “stars). 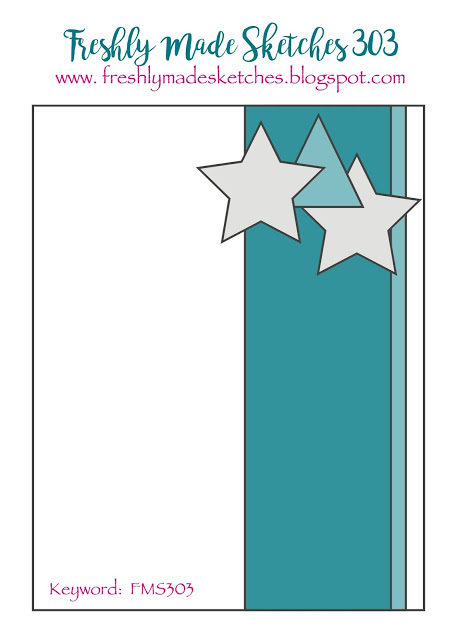 I added a bit more of the Perfect Pearls onto the stars to help them pop. For the trees behind Newton, I used the Land Borders Dies. I was thrilled when it looked like the tops of trees in the shadows. Finally, I colored Newton and his telescope with some more Distress Ink. 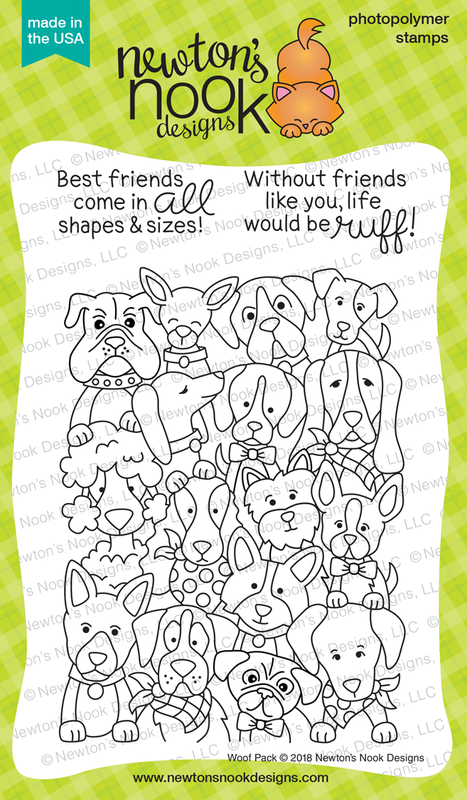 What a fun card to make!! 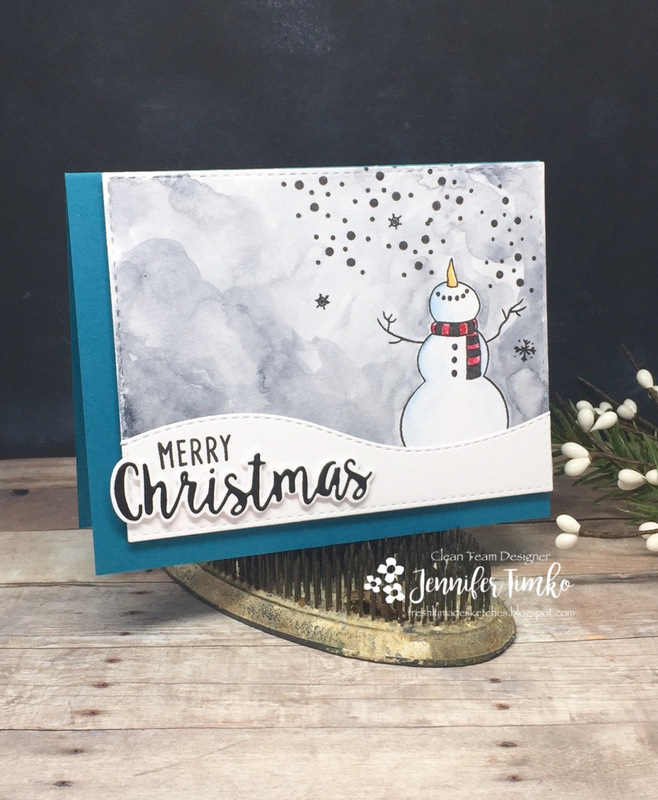 This set just lends itself to fabulous backgrounds and tons of creativity! I’m sure you notice how much fun I have had with the stencils this week. Well, there is a great deal that you are sure to love! 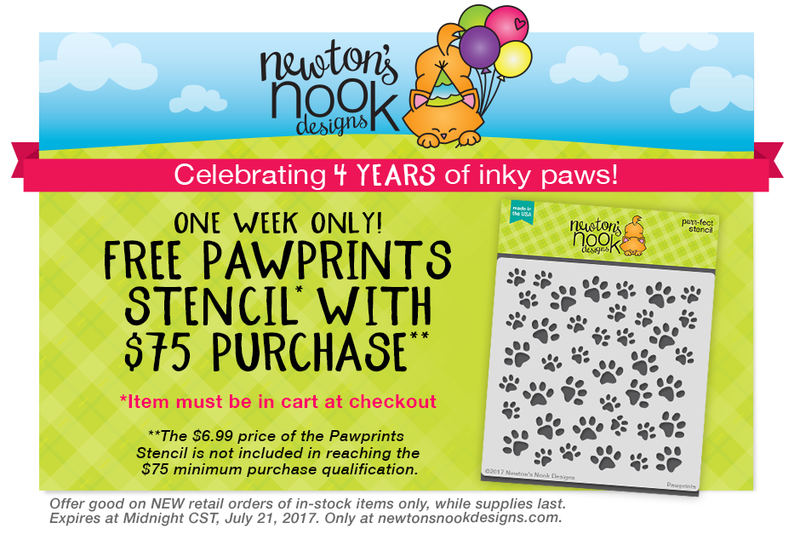 So pretty much you can get the Pawprints stencil free on the order you were already going to make! WIN!! And speaking of winning…there is even MORE to win this week. 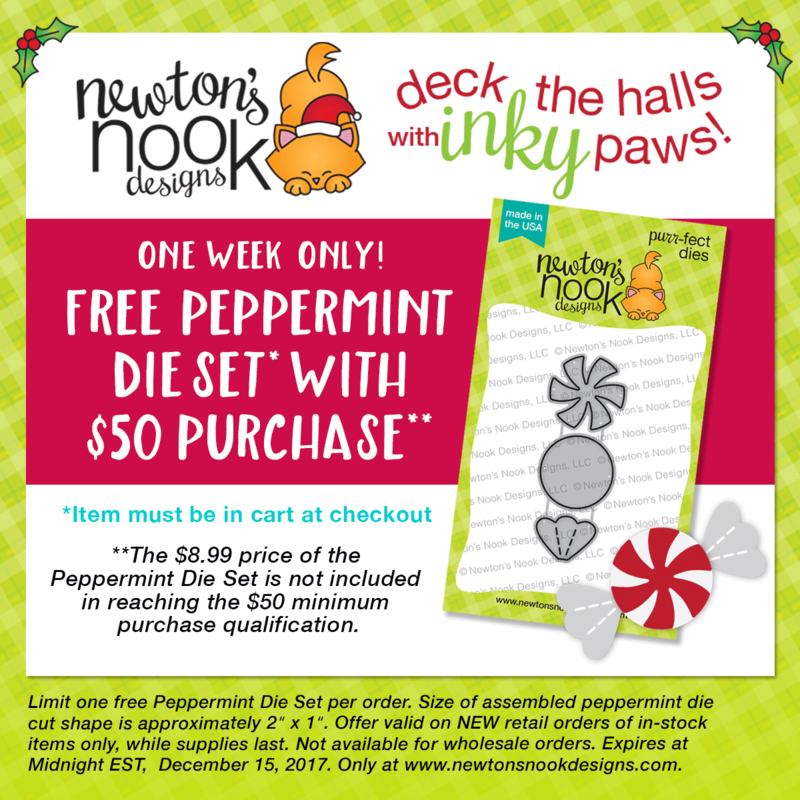 To celebrate 4 years Newton’s Nook Designs is giving away a $25 store credit to spend in their online shop to 4 lucky winners! Comment on the NND Design Team and Special Guest blogs (see list below)! 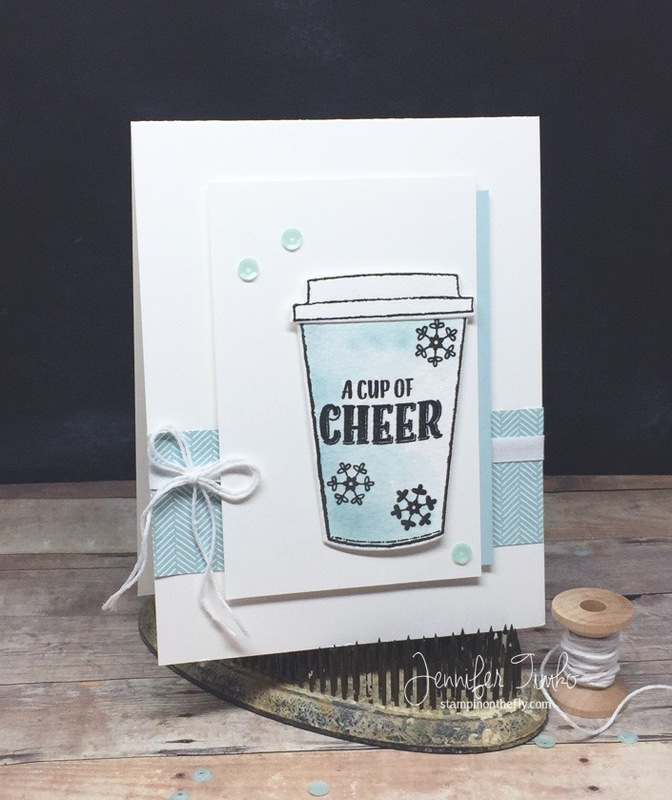 The winner will be chosen at random from the collective blog hop posts. Make sure to check out each of their blogs and comment for your chance to win. You will not know which blog has been chosen so the more you comment on the better your chances are of winning! You have until Sunday, July 16th at 9pm CDT to comment. Winners will be announced on NND blog post on Monday, July 17th and will need to contact us to claim their prize so make sure you check back to see if you’ve won! We hope you have enjoyed this week of celebration as much as we have! Your comments are so kind and your support is appreciated more than I can say. What a privilege it is to share with you all! Thanks so much and see you soon.